There has long been a hunt for a smaller fireplace that combines both small stature and refinement. The Arran Limestone fireplace comes in as a perfect solution, being both small and meticulously crafted for elegance. Arran is a gorgeous, small fireplace that is made from a type of solid Portuguese limestone. The inside of the fireplace is stepped so as to give more room, despite its relatively small size. 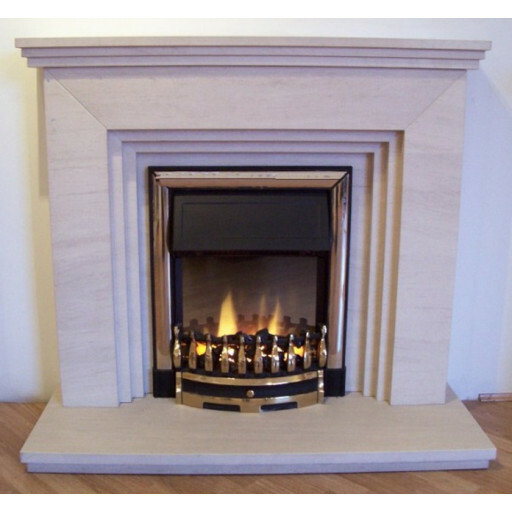 The Arran Limestone fireplace is the picture of style & also available in a lovely cream Milano marble. This piece would make an excellent addition to any room, regardless of the size. As an added bonus, the Arran Limestone fireplace comes with a one year warranty. Luckily, there is little chance that the warranty will need to be used. This 44" fireplace is made of a strong material, so it can be counted on not only to be a beautiful piece in a room, but to last for as long as is needed. When seeking out a small fireplace, nothing can top the craftsmanship of the Arran Limestone fireplace. Just the right size for our small living room,great price too. Very impressed with our new fireplace now its been fitted,finishes our living room off nicely. VERY NICE FIREPLACE AND GREAT VALUE FOR MONEY. Lovely little fireplace with just enough detail....price pretty good too!!!! Got this for my mums new flat looks lovely with her electric fire, she said its the nicest thing in her house!!! !